Before I start, I have a confession to make: I used to hate notebooks. I’ve always loved writing, so I heard the advice to keep a journal or a notebook about a million times. 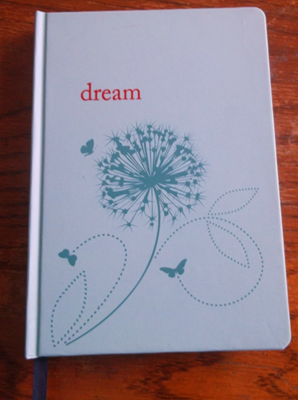 I’d buy a pretty journal, and, after a few days, or, at the most, weeks, abandon it on my shelf. I couldn’t tell why—whether I was too lazy, or real life was too boring, or if I just didn’t know anything worth writing down. By the time I signed up for a writing class at my home school co-op, I’d sworn off journals. At the first class, our teacher handed us each a composition notebook. As part of our homework, we had to write one entry—a page and a half or longer—every day. 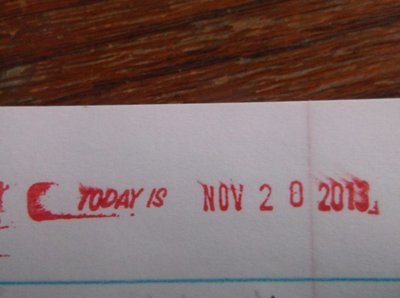 If we’d filled enough pages by the end of the week, our journal was stamped. I started journaling again with all the enthusiasm you’d have for a typical homework assignment. My first entries were mostly lists—favorite books and movies, things I loved and things I hated. After a while I began to write about whatever had been going on that day, and record my thoughts on my writing process. I was halfway through my first notebook before I realized how much I’d started to love it. I usually split my entries in half—one half is a writing log, where I record my daily progress and whine about how hard it all is. The other half is more of a typical journal entry, with anything interesting I did that day written down, plus any thoughts I want to remember. 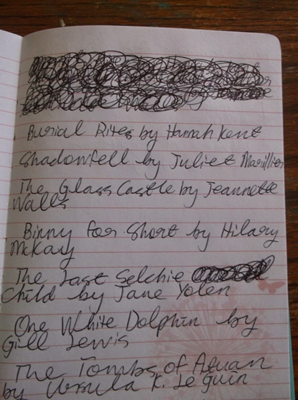 I’ve just started keeping a reading list at the back of my journal. It keeps track of what I’ve read, and each title works like a mini-journal entry—I remember thoughts and feelings I had while reading each book. I write in pen, so my journals are pretty messy! I use a plain spiral-bound notebook for everything else; lists, homework assignments, and freewrites. Every day, before I write anything else, I sit down and write a page on whatever pops into my head first. There’s no editing, and rarely much punctuation or good grammar. 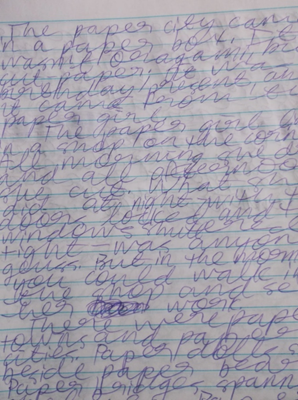 The photo below is of a freewrite from a couple weeks ago. As near as I can remember, it was inspired by a paper model of Paris. The first sentence is ‘The paper city came in a paper box.’ Not exactly a killer hook, but from there it morphed into a description of the girl who makes the paper cities. All day, she sits in her shop, surrounded by paper buildings, animals, and people. She never talks. So far, this description has stayed in my notebook, but who knows? One day it might become the beginning of a story. Freewriting helps keep my writing muscles limber, and it can be inspiring, so I encourage you to try it if you haven’t already. At the very least, it keeps me writing. Though my two notebooks are very different, I keep both of them for the same purpose--to collect things I don’t want to forget. Often, though, an idea strikes when I don’t have time to record it in my journal. For those times, I use index cards. I keep a pile of them on my desk, and more in my purse and backpack. 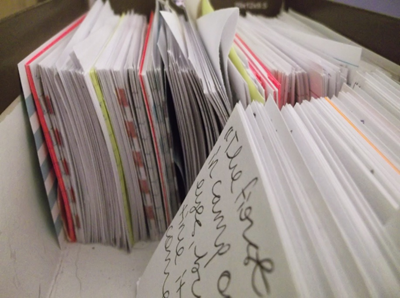 I store used index cards in a shoebox. Anything that inspires me goes on an index card. The two cards in this photo have quotes written on them. The first is from Norton Juster: “I found out that nothing is easy—or should be.” I have to remember this constantly! The next quote, “To be one’s self is a rare thing and a great one.” is from The Farthest Shore by Ursula K. Le Guin. These quotes might inspire a story or the solution to a problem in a story later. For now I can rest easy knowing they’re both stored where I can find them. Looking back, I know the main reason I wasn’t successful at journaling was because I didn’t want a real journal. I wanted a picture perfect notebook full of beautiful writing. I didn’t want to be myself (you can’t ne yourself if you want to be perfect) and I didn’t want to collect all my messy, imperfect memories. Now I have notebooks full of them—and I couldn’t be happier. Alex McCarron is a 17-year-old student living in West Virginia. She’s always on the lookout for a good story, and hopes to write her own someday. In honor of Alex's journals, index cards, and generosity here, I will give away a copy of CHARACTERS & VIEWPOINT by Orson Scott Card. This book has offered Alex a "crash-course in character development", and it will go to noe commenter on this post. Please leave your comment by Sunday, April 20 to have your name entered into the drawing. I agree completely with having to let go of what journal writing should look like in order to be able to actually write one regularly. This was a great post for me in this moment as I am in a writing class and must keep my own journal. I'm trying to be happy with a plain old spiral notebook so I keep my perfection expectation at bay. Thanks! I love composition books, but I also scribble in spiral notebooks of all sizes and I've got some cool journals that I write in, too. It depends on how I feel when I run out of pages: spiral or bound? pretty or plain? Index cards are my newest addition - just started this year because I wanted something small enough to contain the seed of an idea, but not too big that I would feel like I "had to write". Shoebox - excellent idea. My index cards are rubber-banded together collecting dust and taking up valuable real estate on a bookshelf. 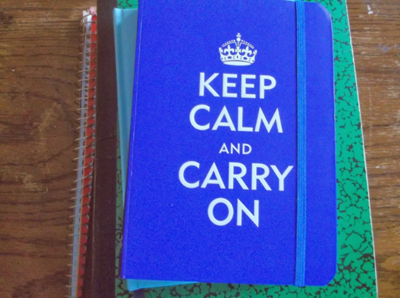 The last notebook I filled was a Keep Calm and Carry On notebook! 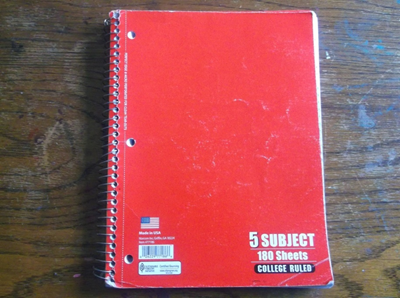 And one of my first notebooks from high school was a red spiral! Alex seems like a kindred spirit. Keep all those notebooks, Alex -- they'll be worth gold as you develop as a writer! 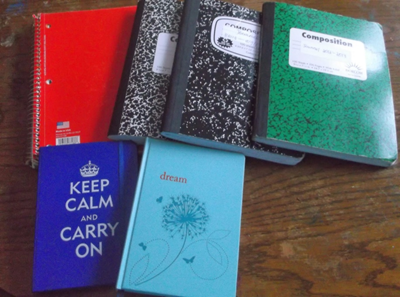 I love this: "Freewriting helps keep my writing muscles limber, and it can be inspiring", and the idea of "messy, imperfect memories" and messy notebooks too. I keep all different kinds too, & have written for years with students (middle-grade - mixed age). I'd like to share your post with those teachers who now teach the middle-school students (I'm the literacy coach now.) I think they'll love what you've written, how one way is not the only way! Thanks, Alex! I keep different notebooks for different purposes. One is a diary of things that I don't want to forget or need to remember. One is full of spiritual thinking, quotes, inspirations, etc. Another is my digital journal--my blog. Another is a private page on my iPad. Alex, your entry brought me back in time. I began to keep journals and writers' notebooks when I was 17 years old--40 years ago. I love your use of note cards and 2 different notebooks. I especially love the note card idea as a way to jot down ideas and things to remember. I enjoyed this very much! I've never been able to get myself into journaling, but I think if I ever found a Keep Calm and Carry On journal, maybe I would try again! I always have notebooks where ever I go to jot down ideas and lines that pop into my head. Nice post. Thanks for sharing it. 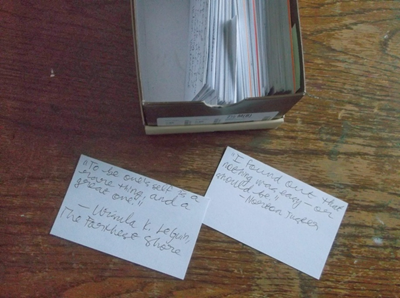 I like the idea of having index cards handy. Your shoebox is a treasure, and you have all of your ideas in one place! Alex, have you ever read any of Julia Cameron's books? Your spirals remind me of those I wrote in when I first read her books and diligently wrote for 30 minutes a day. Maybe I can get back to it! Thanks for sharing your notebooks with us! My journaling is similar. I have a journal, some cheap notebooks I collect other notes in, and a small 3 x 5 ish notebook I carry everywhere to take notes, write grocery lists and such. When I have index cards, I tend to use them as well for random note-taking. I like them because they can be shuffled and organized as I like, not tied to a notebook with other unrelated random notes.